The Book Rat: Reluctant Romance... Guest post from Danielle L. Jenson, author of the Malediction series! Reluctant Romance... Guest post from Danielle L. Jenson, author of the Malediction series! 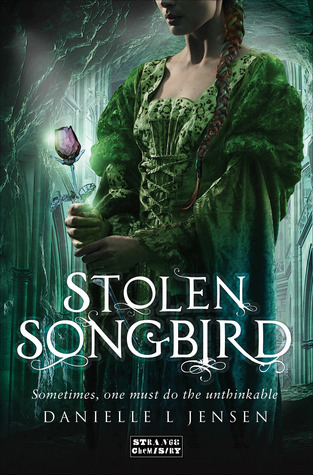 I've mentioned on this blog (and in various vlogs) numerous time how much I loved Danielle L. Jensen's debut, Stolen Songbird. 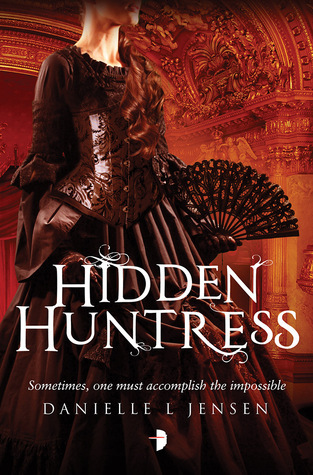 I even listed its sequel, Hidden Huntress among my top 5 anticipated books of 2015, and in all of the amazing books set to come out this year, that's really saying something. So of course, I was eager to invite Danielle back to the blog, to talk a bit about the series, now that the second book has made its way into the world. I gave Danielle a few topics that I personally find most interesting about the books, and she picked her favorite and is here to talk with us about it! Check it out below, let us know your thoughts in the comments, and if you haven't already, make sure to check out this awesome series! In my mind, the big reason why their relationship doesn’t fall into the Stockholm Syndrome category is that Tristan isn’t Cécile’s captor – his father is. The King takes away Cécile’s agency by forcing her to be bonded to Tristan, but he also takes away Tristan’s agency. “You are the last person in the world I’d choose to marry,” I hissed. They are both subjugated to the will of the King, and as much Cécile dislikes Tristan in the beginning, she is not unaware that fact. They both perceive the King as an enemy, and their true relationship begins not in their forced union, but in their alliance against a mutual antagonist. It is in that alliance where their agency is recovered, because it is very much their own creation. Making their relationship realistic required giving it time to develop – a slow burn romance. They begin as allies, become friends, and then fall in love because of the aspects of each other’s character that they’ve come to know and admire. But even given all that, the fact remains that Cécile is a prisoner, which calls into question whether she’d have fallen in love with Tristan if leaving Trollus had been an option. Tristan showed no visible reaction, but I felt Chris’ words strike him to the core. Tristan was silent. I could hear his heart beating furiously where my head rested against his chest. The beach scene is the moment where Cécile is given control over her destiny and, ultimately, where I intended for the reader to see that she isn’t living a life that she was forced into, but one that she chose herself. Interestingly (at least to me), Cécile addresses much of this in a scene in Hidden Huntress where she is asked whether she regrets that decision, and she gives sort of a summary of their relationship. He’d been snide, nasty, and wicked, and I’d loathed him. Except even then I’d sensed something wasn’t right, that there was a mismatch between what I was seeing and hearing and what I felt. It was this mismatch that made him captivating, and even as I was grasping for ways to escape, the need to know more about him had lurked in my heart. That need had only been compounded when we’d been bonded; the veneer of his exterior cracked to reveal a young man so different from the one he pretended to be. A Tristan whom I was uniquely privileged to know. He became a puzzle I needed to solve – the key, I’d thought, to my freedom. Except solving him hadn’t relinquished his hold on me. I remembered the moment in the empty palace stables where the truth had come out, when I’d finally seen the emotions filling my head written across his face, and the veneer had fallen away entirely. It was then I stopped seeing the troll and began to see him. He became my friend, my ally – and the leader of something I could believe in.